This post covers the designs in which I pierced the front of the card in some way to create the effect I wanted. You must realize as you view these that I am always on the hunt for new card ideas. Whenever I visit a museum, I always stop at the gift shop and check out their cards. Holiday catalogs are great resouces. MOMA falls into both categories. I have always anticipated the arrival of the MOMA (Museum of Modern Art, NYC) catalog to view the incredible creativity displayed in the cards they offer. This designed was inspired by the material. My mom had found this beautiful, textured gold paper and given me a roll. She was a tireless scavanger, always on the lookout for great craft materials at every store, shop, tag sale or church fair she attended. I grew up in a house with huge stashes of craft materials always available and my mom was always willing to do projects. 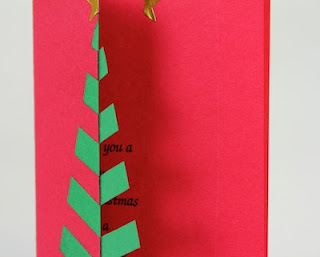 I used that gold paper from my mom to line the front inside of this card. I then cut triangular slits and curled the resulting tab back to the front. I took all five points and held them in place with a double red sticker. 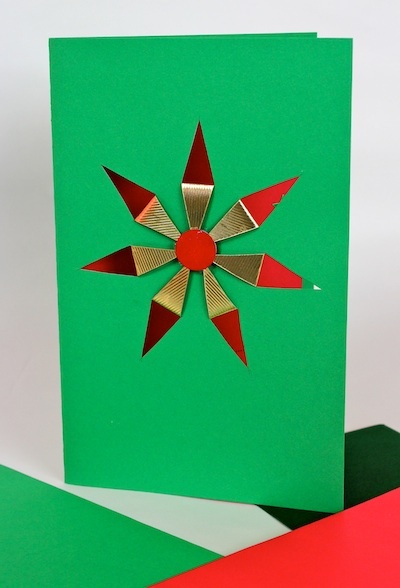 It created a nice relief effect and the gold textured paper made the design. 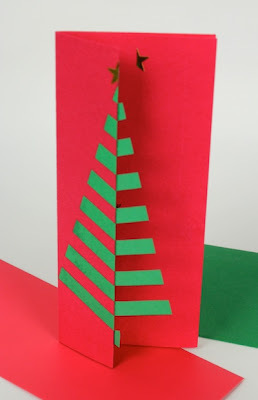 My love of geometry shows through in many of my card designs. Drafting programs on my Macintosh computer allowed me to create precise geometric, patterns. I printed a patttern to guide my cuts on the back side of the white paper used in this design. I then carefully cut all the lines with and exacto blade and folded down the angled shapes. The tree effect was created by using a size gradation in the pattern and allowing the green to show through. 12/1/2013 Update: I have just uploaded a tutorial for this card on my Silhouette tutorial site. The pattern for this card is available at the Silhouette Online Store. Link here. The tree theme shows up most often in my designs probably because I love the graphic simplicity of a triangle. 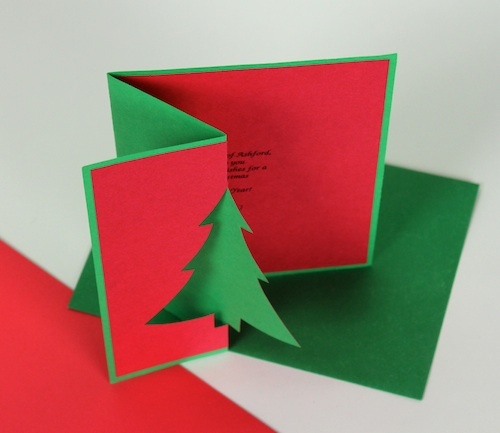 This design is a simple variation of other folded concepts. The closeup view shows how I lined the front cover with green paper, sliced it and folded half back, gluing it in place. 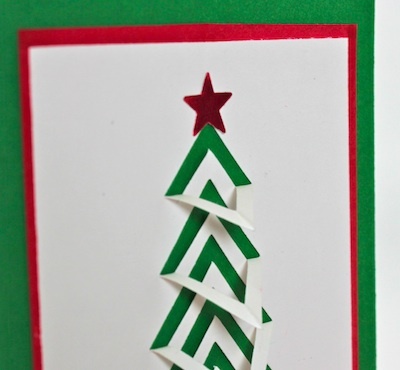 I am sure this design was inspired by a MOMA card. It is another of my favorites because of its simplicity. 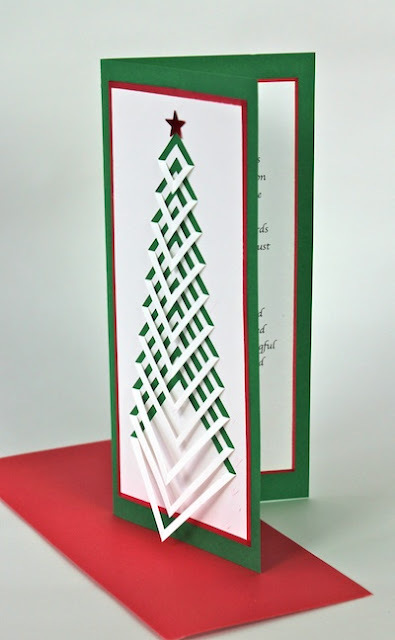 This angle view shows how I cut one half a tree aligned to the middle of the card front. I then folded it back on itself. 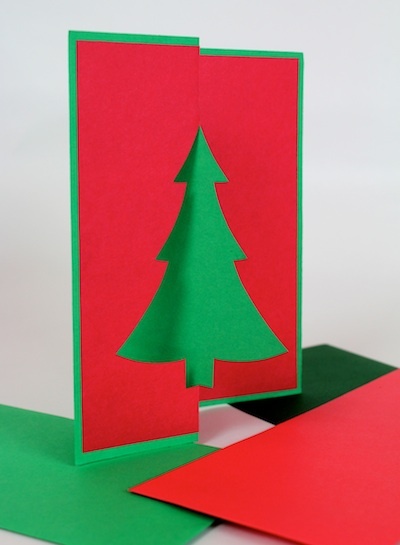 By using paper of two different colors, the silhouette of the Christmas tree appears in the negative space. When designing cards I always make sure I have an envelope to fit the design before I start creating. 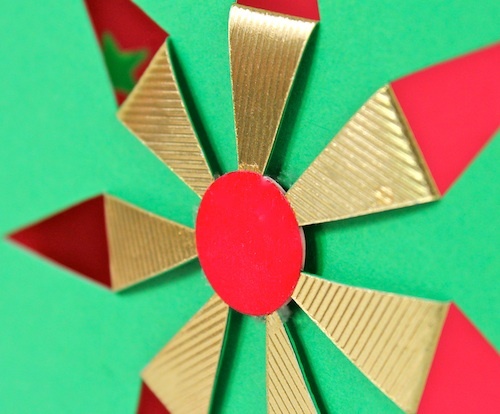 It is impossible to get red and green envelopes close to Christmas. 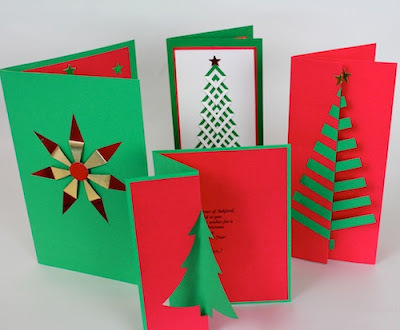 One option is to buy leftover boxed cards just after the holiday and use the envelopes for your designs the following year.